Note: Vehicle permits are not required for Baja, northern Sonora State & Quintana Roo. 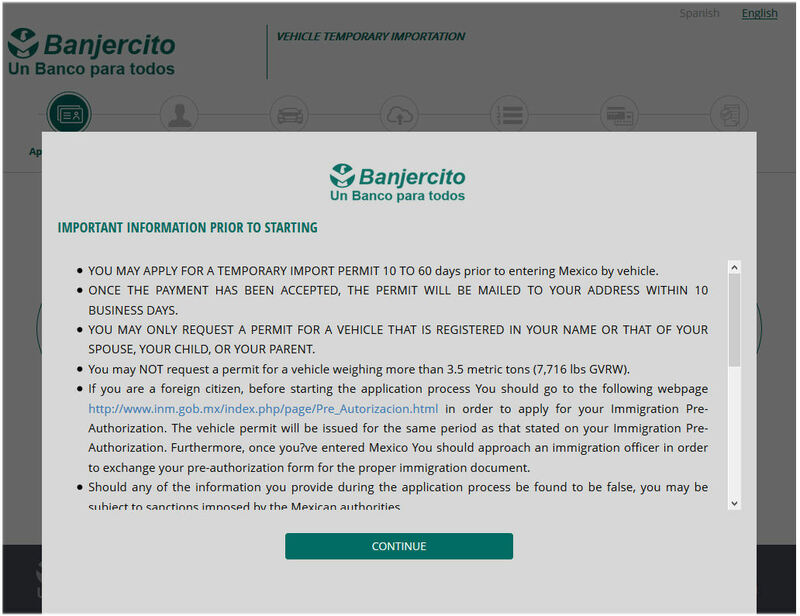 You cannot get a vehicle permit if you hold Mexican Residente Permanente status, you can if you hold Residente Temporal. Important note (Jun 3, 2016): I am getting reports of people being refused permits for 3/4 ton trucks & up. This is because they are taking the GVWR figure off the registration or door sticker, which is the max loaded weight of the truck & cargo. In these cases the 3500 kg limit is exceeded. Banjercito's own website is contradictory on this subject (see images for downloading below). Problem crossings appear to be the Guatemalan border, El Paso, Laredo and la Paz (ferry from Baja). I have had no reports from Nogales which is my recommended crossing. In the interim, I strongly suggest anyone with a 3/4 or 1 ton pickup, download these files and print them out and I also suggest taking your unloaded truck to a commercial scale and get a print out of its unloaded weight. Ask them to put the VIN number on it if they can. To confuse matters more, the SAT website (they set the laws) states it's 3500 Kg (7710 lbs) cargo capacity. This is NOT GVWR. GVWR is the safe max loaded weight of a truck to where the axles and braking system (whichever is less) can withstand the load. GVWR is the Curb Weight of the truck plus the maximum cargo capacity (including Pasenger weights) set by the manufacturer for safe operation. It is NOT just cargo capacity, as they appear to be interpreting it as. GVW is the weight of a vehicle, loaded or unloaded with cargo, at any given time. GVW is fluid number, GVWR is not. 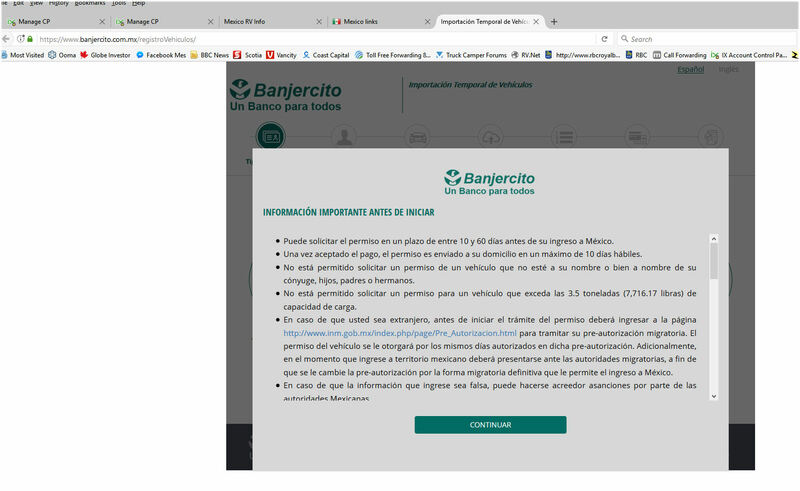 I believe this all boils down to an issue with translation from Spanish into English in Banjercitos documentation. SAT sets the regulations, Banjercito applies them. Update Aug,2016: The latest is that if you are over, they will send you to customs to inspect the truck to make sure it is a passenger vehicle, not a commercial one. I will have more info in November 2016, after I cross myself, with my 1 ton. Update Oct,2016: The latest is that this problem has been resolved. The individual who caused it no longer works fo Banjercito and things are back to the way they were before. We will see. Update Sept, 2017: The issue seems to be back, Mike & Terri Church who write books on Mexico Camping, were refused a permit on theri 1 ton PU, at Laredo (both Crossings). Update Oct, 2017: I am now getting lots of reports of people being denied permits at all Texas crossings if they have a 3/4 ton or 1 ton truck or E350 van. I do not know at this time if they are blocking people who already have obtained permits on line (see Vehicle Permits). If anyone manages to get across with a pre-approved permit, I would like to hear from you ([email protected]). I did successfully get a permit for my 1 ton on-line. I advise anyone with a 3/4 or 1 ton truck get their permit on line ahead of time. The Nogales, Az crossing does not seem to be an issue, so at this time I advise anyone with a 3/4 or 1 ton pickup to use that crossing rather than any of the Texas crossings. The advantage of Nogales is that they are unlikely to walk out and look at your door sticker, as it is 5 minute walk for them at that crossing, and you are already clear of the border bsing in the free zone. This is what Mike & Teri Church did afer being refused at Laredo. and they got across OK.
Update Feb 2018: I have encoutered a few rigs with Travel Trailers or 5th wheels who have obtained a 180 day permit covering both the truck & trailer. I have been assured by Customs that this is not legal, although they got away with it, due to the ignorance of a Banjercito agent. The only trailer you can add to a truck permit is a cargo or utility trailer, not an RV. You must obtain a separate 10 year permit for the trailer. If you manage to cover it with a single 180 day permit, you will have a lot of difficulty at the border if for some reason you write off that trailer in Mexico. You will also have issues if you cross through the mandatory inspection station on the road to Palenque where they are sticky about rules. I saw 2 impounded RV's there this season who had improper parerwork. Update Oct 2018: So far this sesson I have no reports of refusals. However there was a new wirnkly at Nogaes. They wanted a phot of someones Truck & trailer, taken from the front, down the side, showing the truck and trailer. Also a photo of the door sticker. Best to be prepared and do this ahead of time and print it out. Don't offer it, but you have it if they ask. ULSD Diesel : This is available at 3200 stations in Mexico as of May 2017 but they are not marked. See ulsd.php for more info and a list of stations. It will be 100% by December, 2018. I believe most stations are now actually pumping ULSD by Spring 2018, but do not quote me on that. Update: As of Oct 2018 I have been informed ULSD is now the norm all over Mexico. by Lic. Jacques-Edouard Beaulne, LL.B. Previously, anyone that wanted to enter Mexico, either as a tourist or for any other reason, had to fill out an FMT known as a tourist card. The maximum time one could be legally in Mexico was 180 days, but this maximum period was at the discretion of the immigration officer at point of entry. This document is no longer available, and the discriminatory factor has been removed by the new law. The new system provides established time periods in Mexico of up to 180 days depending on the activity an individual will be doing while in Mexico. In the event that a person wishes to be in Mexico for a period of 180 days or less, he or she only has to acquire an FMM, fill it out indicating the reason for entering the country and present it to the immigration officer at the point of entry of Mexico. If entering via land, individuals can acquire this document at any Mexican Embassy or Consulate. If coming via air or sea, individuals can acquire the FMM from the transporter. The cost of the FMM is included in the ticket, otherwise payment is due at time of issue at the bank. The new system permits lucrative and non-lucrative activities anywhere in Mexico without the need to have an FM-2 or FM-3. This being said, individuals must still remember that the law does not permit a foreigner to displace a national in a working place. In other words, a person can not come to Mexico and do work when there is a Mexican who can do the work. Also, for some permitted activities under an FMM, the time allowed is reduced, and at the end of the permitted time, the person must exit the country. Finally, and very importantly, the new system does not permit a child of a person holding an FM-2 or FM-3 to be able to stay in the country after the time has terminated. When an individual wants to enter Mexico to establish a permanent or temporary residence, he or she must first request a Visa at any Mexican Embassy or Consulate; once holding the Visa they must obtain an FMM from any travel agency, air or sea transporter or at any point of entry in Mexico. The FMM will be valid for 30 days in which time, a request for either an FM-2 or an FM-3 will need to be made. At the end of the 30 days, if the individual is still in Mexico without having requested the change, he or she will be considered illegal in the country and sanctions will be applied. This being said, the law also indicates that anyone who is considered illegal could be legally admitted into Mexico under certain considerations. Individuals may apply for Mexican visas directly, in person, or may hire a representative to do the paperwork and administration on their behalf. If coming to work or run a business, additional files for that business must be presented. The immigration documents are good for five years and must be renewed within 30 days from the expiry date. The person must be present to sign, present pictures, and provide fingerprints. In other words, individuals must be in Mexico when renewing, since the new form is an ID card. Contrary to what you may have been told, FM-2s can be acquired at the time of entering Mexico for the first time if individuals can prove that they are immigrating permanently. With fewer requirements, the new system is more liberal than the previous one, and it removes some of the discretionary powers the immigration officers once had. Hopefully, it will be more efficient and save everyone time and money. Warning: There have been very rare reports of the occasional customs agent only accepting the original International Health Certificate which includes a folio number. In 2011/2012 it stated that certificate must be dated no more than 10 days prior to entry to Mexico. That requirement appears to be dropped by Fall 2012, but I would advise having it as recent as possible. You require a passport, a credit card, drivers license & all your vehicle registration. If the vehicle is leased, you require the lease agreement plus a legally notarized permission to take the vehicle into Mexico, even if you own the company. It is best to have this in Spanish. Make 2 copies of everything before leaving home, it will speed things up. There is usually a copy machine at the border. You will need copies of your tourist card, but it will speed things up if that is all you need. At the border you will have to purchase tourist cards & a vehicle permit. Allow about $100 for everything, other than your vehicle deposit which I describe later on. Try to have $100 US worth of Mexican Peso's, for incidentals, until you can find an ATM. Note: Under new rules as of Spring 2011, you will have to pay a deposit of $200-$400 depending on vehicle year (<2000 $200, 2001-2006 $300, 2007 & newer $400). This is to ensure the vehicle is returned to the US. The money will be returned or credited back to your credit card when you leave the country. You have to use either Visa, MC or US Cash. I have seen reports of problems getting the credit card credited on exit, I recommend using cash. You will be refunded cash on the spot upon exit. The rates & years for vehicles were valid as of January 2012. I presume the years will advance by one in each following year, so that a 2007 vehicle who pays $400 this year, will pay $300 in 2013. It can take up to 4 hours to clear the border, but an hour is more usual. Please note that at some crossings you have to do all this, maybe 20 km south of the border, rather than at the border itself. Vehicle permits are not required for Baja or for the northern part of Sonora State. You still need a tourist card. Even so, make sure you have all the legal documents for your vehicle. Vehicle permits are good for 6 months, although you will get a 10 year one for some RV's (Class A's & C's & some Class B's, plus 5th Wheels & Trailers (but not the tow vehicle). Unless you plan to leave the vehicle in Mexico for a few years and not bring it back into the US, you may want to cancel it on your way out. It can cause you a lot of grief if you write the vehicle off or sell it sometime during those 10 years. However, it does allow you to leave the RV in Mexico & fly home. (See section on returning sticker further down this article) If you do write off a vehicle in Mexico, get the hunk of windshield with the sticker attached , plus ensure the police & insurance reports show the vehicle VIN number. Unless you turn these in at the border, you will not be permitted to take another vehicle into Mexico at a later date. If you do have an accident, phone your insurance provider immediately and do not admit blame. They will provide a lawyer. You may or may not need a separate permits for motorcycles & ATV's. It depends on the engine size. If you have a scooter, the word for that is "motoneta". Up to 3 items can be added to a vehicle permit, including trailers, scooters, ATV's (Maybe a Truck Camper) but see the "Gray Area's" section below. You can have only one 6 month permit & one 10 year RV permit in your own name. Eg. A Motorhome towing a car. Example 2: A PU truck with a Slide in camper, towing a car will likely require 2 six month permits and require 2 individuals. Like a husband & wife. Note: Not all crossings have a copy booth so make copies ahead of time. 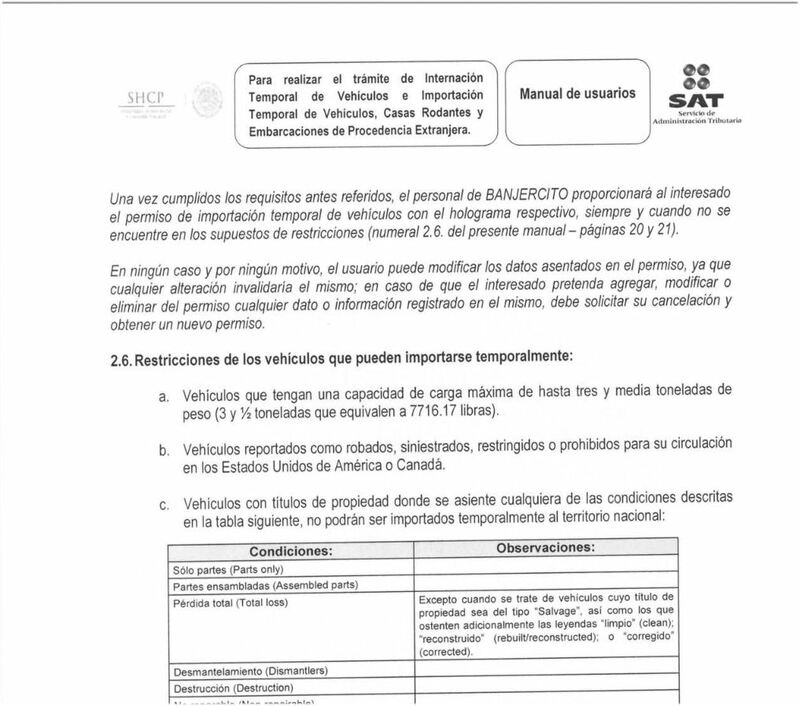 6) Copies of notarized permission to take any leased or company vehicle into Mexico. Also if you are driving into Mexico alone with a vehicle co-registered in another name, have a notarized letter, preferably in Spanish, stating that the other individual has given you permission to take that vehicle into Mexico. Note: If you scan & print, ensure the printed images are the same size as the originals. They can be sticky over that. You may or may not need all of those. You will have to get photocopies of your Mexican visa at the border itself at some crossings. At smaller crossings with no copy booth it won't be required usually because in those cases the Banercito booth and the visa booth are often combined. You will receive a sheet of paper with your vehicle sticker, which you must affix to the windshield. It looks like the first picture below. You will also receive a receipt for your vehicle deposit. It is important you keep both these (the form less the sticker plus the receipt). You will need both when you exit Mexico. It is very important to get a receipt for your vehicle permit when you cross back into the US, (see 3rd picture below) no matter what crossing you use. Failure to return the sticker will prevent you from entering Mexico in future and even if you have returned it, their record keeping system is far from perfect, so you should retain a receipt. You cannot return it at all border crossings. You can no longer return at Tecate, for example. Crossing back into the USA can be a 2 or 3 hour experience. You may not bring any Pork or Chicken products across and some vegetables are not allowed, specifically potatoes & avocado's. If your remove the pit from the avocado's & cook the potatoes, they are OK. Most fruits are prohibited. Please note your vehicle may be searched by US border control on the US side and again by Mexican border patrol on the Mexican side. They are looking for guns going south & drugs going north. Both governments stepped this up in 2010. IMPORTANT: I cannot emphasize enough how important it is to return this permit before you cross back. If you do not, you will not only forfeit the $200-$400 bond you placed on your credit card, you may also be unable to ever bring another vehicle into Mexico again. If you write off your vehicle in Mexico, or have the windshield replaced, ensure you keep the glass with the permit on it and have a police report showing the VIN number of the vehicle. In the case of a windshield, it is not so important since you will have the original vehicle &, its VIN number shows on the sticker. You need all of that sticker, however, even if it is pieces. As a precaution I always take a copy of the sticker before applying it to the windshield on the way down. If the original is unrecoverable, at least that may suffice. Maybe. Can you leave a vehicle in Mexico while you fly home, for eg over Christmas? Truck Campers: These seem to fall between the cracks when it comes to RV rules. You cannot seem to get a 10 year RV permit for them, in most cases, but you can manage it if you do it on line. I did, and got away with it 3 years running until I sold it. Simply classify the truck as an RV and use its VIN number. Normally they appear to consider it part of the truck. What worries me is if I am in an accident or it is stolen. I would try to obtain some sort of documentation with its VIN number to prove you own it. Insurance certificate and/or Bill of Sale. Motorcycles: From what I can determine you can bring in a motorcycle under 150 cc (it may actually be 250 cc, another thing I cannot get a straight answer on) without a separate permit. They have added my 50 cc scooter to my truck permit each year. The rule actually states it should be unlicensed, so my advice is remove the plate when entering or leaving Mexico & put it back on when in Mexico. Make sure you do show them the registration when you enter, however. ATV's: In theory to bring an ATV in you must have a passenger with you. One gas powered vehicle per passenger, although as with scooters this appears to be flexible. It will likely be added to the main permit. If unregistered you will need the sales receipt. Cargo Trailers: These can be added to the towing vehicle permit. You may have trouble if they have no VIN number such as in the case of a homemade trailer. Temporary trips home: From what I can tell (And I have had contradictory info on this one as well), you can definitely leave an RV with a 10 year permit in Mexico & fly home, you cannot leave a vehicle with a 180 day permit in Mexico & fly home. Lots of people have done it, but now they are supposedly tying Passport numbers to vehicle permits, you could find yourself in trouble. In my case my wife does fly home. I make sure the vehicle permit is in my name, not hers. Note: be careful of labor rate ceilings. Some cap at $75 or even $38. This will not cover the labor rate in the US if you have to have it repaired there. HDI (Sanborns) & Qualitus (Lewis & Lewis) appear to have no ceiling. Most policies start at noon PST of the start date, you may want to start your insurance a day before crossing. You must have Mexican insurance. Expect to pay about $60 - $75 US for each $10,000 of value (RV & truck). This is for a 6 month policy, the most economical. You can purchase insurance before crossing. AJO, Mexpro, Don Smith, Baja Bound, Sanborns, Motor Mexico, Lewis & Lewis, Sanborns or San Xavier are a few that are recommended. Shop around & compare coverage & price, but it is best to use one that others have recommended and you know are OK. Do not underinsure yourself. In many cases you can get a rebate from your insurer for the time spent in Mexico. Ask them what proof they require that your vehicle was below the border. This will likely give you a couple of hundred back. If not, consider cancelling your North American insurance for the day after you cross & re-instating the day before you return. (more info on this below). Another trick to save money is to consider placing storage insurance on any vehicles you leave at home. You may buy insurance for various periods from 1 day & up. At some point it becomes more economical to buy a 6 month policy. In most cases, one policy can cover your truck, RV and other vehicles like scooters or ATV's & trailers. You can often buy insurance where you obtain your vehicle permit. Unfortunately this is often 20 km into Mexico, and Murphy's law increases your chance of having an accident in those 20 km. Remember an accident in Mexico is a felony, not misdemeanor. Buy your insurance before crossing the border. If you have an accident, immediately phone the number given to you by the insurance provider. Do not admit blame, let them handle it. This is a good reason to have a cell phone. Even if its an American or Canadian cell phone & the call is expensive. The police will very likely impound the vehicle until things are settled. In Mexico you are guilty till proven innocent. The insurance company will take care of legal aspects & provide an interpreter. It is not as bad as it sounds, your Mexican insurance provider is used to being able to deal with it. Here is another article on the subject by Jim Labelle. Check with your insurance company . You may be able to get a rebate for your insurance for the period you are in Mexico. For example, ICBC in British Columbia does this. Check with them to see what documentation & proof you will require for a rebate. If you are down for 4 or more months, chances are it will neutralize the cost of your Mexican insurance. Make sure campground receipts show your plate number & keep entry & exit receipts plus toll road receipts. Some US insurance companies also provide collision coverage in Mexico & you may only have to buy liability coverage. If your RV is separate from your vehicle, like a Truck camper or trailer, also check with the company insuring that. There are a lot of RV parks in Mexico, but many of these can be quite full during the peak period of November through March, especially on the West Coast, north of Manzanillo. Boondocking is possible, but not advisable if alone. You may overnight in many Pemex Stations. Campsites & RV parks range from about $5 up to $30 US a night. The most expensive ones I found were in San Carlos & Sayulita, near Puerto Vallarta. $18- $20 US is more the norm. For that, you usually get full hookup's. From November through March, remain flexible, or reserve. It's as safe as you make it. Most of the problems are within 100 miles of the US border, mainly in Tijuana and Cuidad Juarez. RV'ers who follow a few rules are probably as safe from violence as they are in the US, especially in a group. Avoid traveling at night and never park overnight on the side of the road. Avoid hanging out in large crowds & in bars with Mexican nationals. There is a case of a Canadian in jail down there. He was arrested when he was drinking with drug dealers. He had no idea that is what they were. You may have heard of the RV'er being shot in the leg in March 2010 in an RV Park in Mazatlan. He was fending off a robbery attempt. This is an extremely rare incident, in fact I have never heard of another like it, where an RV'er was following the basic rules of safety. Before you panic & think you will be murdered, try looking up similar incidents in Canada & the US. Possibly you should be more scared of campgrounds in those 2 countries. I should mention that the Mexican authorities in this case paid all the medical expenses, flights home for the man & his wife, since the man could not drive) and offered to pay a flight down for someone to drive their RV back. Let us put this into perspective by comparing a couple of incidents in Canada & the US. 3 examples from July 2010. 2) An elderly couple in a Motorhome disappeared on their way from Alberta to BC. Their burned out Class A was found with the tow vehicle missing. A week later the towed SUV was found in the bush several hundred miles away. Their bodies have not yet been found. This is in the area that 100's of American RV'ers pass through each summer on their way to Alaska. Are they going to be scared off. Not likely. 3) A shootout in a Washington State Park kills 2 & wounds 4 other. Guadalajara, Mexico's second largest city, has a lower murder rate than the top 80 listed US city murder rates. It has 1/2 the rate of the top 25. Mexico City's murder rate is the same as Los Angeles, there are 40 US cites that are worse. Cuidad Juarez on the other hand is off the scale. Don't go there. If you do encounter trouble on the road, you will find Mexicans far more inclined to stop & offer assistance than is the case in either the US or Canada. There are stats available for Canadians killed in Mexico. For 2006-2010 it was 15 (murder & accidents). During that period there were 4.5 million Canadian visitors. If you do the math and assume an average trip of 10 days, that is not that much larger that the same stats for that number of people, had they remained in Canada. I suspect if you could find the stats for Canadian visitors to the US (You cannot, I tried - if you Google it you get articles about murders in Mexico, which proves which country gets the negative media coverage), the figure would prove to be higher. I have not experienced this. Most Mexicans I have encountered are more friendly than either Americans or Canadians & will go out of their way to help visitors. Just remember it is their country & they are proud of it. Americans may possibly find a bit more hostility than Canadians, due to the current border wall thing, etc. but none have complained to me. I have found most Mexicans treat people as individuals without preconceptions. Avoid overt signs of wealth or superiority, and avoid flying American or Canadian flags. If you must, ensure a Mexican flag is displayed more prominently. Displaying a Mexican flag is much appreciated. Remove any :Make Americsa Great Again" stickers. Mr. Trump is not popular. Many Mexicans speak at least some English. Attempts at speaking Spanish are appreciated. Most larger Mexican cities have Ford, GM & Dodge dealers & service. Service tends to be quite a bit cheaper than in the US, but here could be a few days wait for some parts. E-Class tires are hard to come by. Carry a good spare. If you have room, an extra tire, off rim, is not a bad idea. Carry coolant & oil. Green Angels which are sort of like the AAA, cruise the highways helping tourists in distress. They do not charge anything except for parts, and most of them are legendary mechanics. Most highways are however patrolled only once in a 24 hour period, so timing is everything. I have heard that on the Cuota's (Toll Highways) towing is free. AAA is no good in Mexico, Sam's Club does provide some service, so they are recommended. That one is tougher, RV parts are tough to find. Bring an extra sewer hose and any other specific fittings you think you could conceivably need. Distilled water for your battery is also not a bad idea. If you tow a trailer, consider carrying an extra wheel bearing kit and possibly spare U bolts if they are used on your trailer. They can be difficult to obtain. I actually also carry a spare RV water pump, I kept my old one when I installed a constant flow one. No, usually not. Bring a refillable water container. (Maybe in your shower stall). These can be filled at almost any town, or exchanged. Maybe wait to get one in Mexico, they are available in almost any store and look for one the screw top types rather than the compression caps. These are very easy to find in Mexico, and means you can reseal it after each use, a good thing, especially if you are carrying it in your shower. There are different brands and you can only exchange like for like, so be prepared to pour from one container to another, so you can immediately return the empty. Expect to pay about 15 Pesos ($1- $1.25) for a large container fill. Use local water to fill your holding tank & use one of those blue cylinder water filters to ensure that sediment does not get in. They can be obtained at Camping World in the US or Canada Tire in Canada for about $20. They claim to remove bacteria & guardia, but don't trust them for drinking, but at least it is probably safe to use the water from them for teeth brushing & washing dishes. You can put a cap full of bleach in there & use that water for showering & washing dishes. If you get Montezuma's revenge, Cipro (Ciproflaxino in Spanish) is available over the counter in Mexico. Flush your tanks a couple of times with good old USA water after you come back. Don't forget the hot water tank. RV parks usually have them, so do bus stations in a pinch. I have never tried using one, but I have heard some will let you pay to use them. Power in Mexico can be very inconsistent. Voltages can range for 80 to 150 volts. I advise everyone to purchase a power surge protector. These are about $250 at Camping World for the 30 amp model, add about $75 for the 50 amp model. Otherwise you run the risk of blowing your fridge circuit board for starters. Many RV parks have only 15 amp service. It is actually not a bad idea to keep your fridge on propane. It can be trickier find propane, or butane, as is often used instead. You cannot get it at gas stations, you have to search for a central outlet, usually located near larger towns. They will be called things like Global Gas and you will see the large white containers. Simply take your tank over to one and ask to have it filled. Sometimes refill trucks will come around RV parks. Please note that Butane can freeze, so if you are returning to colder climes, use it up first. All auto fuel in Mexico is sold through Pemex. prices are usually around $2.75 a gallon for diesel (2011) and it is widely available. Sometimes you will find resellers using barrels in real small towns. Use these only as a last resort, and you won't likely find diesel, only gas. Mexico subsidizes fuel prices when the world price goes up. Diesel pumps are BLACK, not GREEN in Mexico. Green pumps are gas. ULSD is not widely available until late 2018, so if you have a late model diesel, you may not want to take it into Mexico. However, many do with no apparent ill effects. See this article. A locking gas cap is advisable. This prevents attendants from starting to pump without zeroing before you are out of the truck or pumping the wrong fuel. In most cases you have to pay cash, so make sure you always have 1000 peso's in cash available. I always tip the attendant about 20 peso's . They really appreciate it, and it gives us Gringo's a good name. If someone washes your windows, give him 10 peso's, he may not actually work for the station & relies on tips. I would carry 1500 Peso's as there are toll booths to contend with as well. That brings up another point, a portable air pump is useful, it is hard to find places that can handle more than 60 PSI. From what I can tell, it is illegal to turn right on a red light. A very common practice in Mexico is to activate your left hand turn signal to indicate to the vehicle behind that it is OK to pass. Many trucks do this. Obviously this can be very dangerous. If you do indicate you are about to turn left or move out to pass, ensure no one behind you is taking that as a signal, they can pass you. One way roads in towns are very common and sometimes not very well marked. Another quirk are left hand turns out of lanes to your right. These are associated with left hand turn signals, but it is very disconcerting to see cars turning left across the front of you. Many larger towns have lateral roads that parallel the main road. In some cities you are required to use these if you have an RV. Puerto Vallarta is one example. You will get ticketed if you do not use them. If you see buses & trucks using them instead of the main road, you can bet that is the case. Low hanging trees or trees close to the edge of the road are a hazard especially to high RV's with vinyl roofs. It is very easy to get trapped in small towns on roads that have low trees, so exercise caution & try to use roads you see trucks or buses using. Low hanging power lines are also a hazard. One trick I have done is to create a guide using nylon tent poles. I cut them down so that if I hold the bottom (or a tape mark near the bottom) level with my eyes, the top measures my clearance. I then walk under the debatable object with it. Some free roads have very little shoulder and sometimes that shoulder is very steep, so exercise caution. Since driving in Mexico takes more concentration, try to keep segments short, and be aware of what is behind you. It is easy to forget to check your mirrors when you are concentrating a lot harder on driving. I find driving more than 200 miles a day is tough down there. These are speed bumps. Most are marked, some are not, and they are common on main highways (but not on toll roads). You do not want to hit one of these at over 5 KPH. Keep watch on the vehicle in front, to alert you to them or approaching vehicles that may give away their location. . I can guaranty you will hit at least one, too fast. Vibradores are series of small speed bumps, you can usually take at 30 KPH. A Vado is a dip in the road designed to allow streams in flood to pass over the road in rainy season. Some of them can be quite deep & a hazard especially if towing a trailer. Tope's are a favorite spot for vendors, who can be a pain, but they are also frequently manned by people collecting for charity, notably the Red Cross. Keep some small change handy. As of June 1st, 2009, you require a passport to travel between Canada, the US & Mexico by road. Make sure yours is good for at least 6 months & carry photocopies of the main page. It is also a good idea to carry your birth certificate & picture ID. You must have one licensed driver (& registrant for each motorized vehicle). If you have a camper & 2 motorcycles & there are only 2 of you, you may not be allowed to bring one vehicle into Mexico, although apparently this rule is being relaxed. A motorcycle under 200 CC's does not count as a vehicle. . Ensure that registrations for more than one vehicle are not only in one name. If so transfer one to your wife. You will need to leave a $300 deposit at the border or a credit card imprint. Keep in mind that a towed vehicle will increase your toll highways cost a fair bit. No, don't even think about it. Also no ammo. You can carry a machete if it makes you feel better. Checkpoints are common in Mexico. Don't let the guy behind sandbags with the machine gun scare you. They are looking for drug runners, not overweight Truck Campers. They seldom stop RV's, but they may. There are also agricultural checkpoints at many State lines. They will confiscate some fruit & vegetables. Some cops still take bribes, it is known as mordida. Is it legal? No, in fact bribing a police officer is a criminal offense. If you think he is trying to shake you down, offer to follow him to the police station to pay the fine right away, the ticket may suddenly change to a warning. This all assumes you can speak Spanish or the cop speaks some English, of course. Sometimes the best tactic is to pretend you do not speak a word of Spanish other than beer, even if you do. If the officer speaks no English, this may frustrate him enough to let you off. Just keep smiling & playing the dumb Gringo. It is very difficult to advise how to handle each situation, you have to simply play it as it comes. It may come down at some point to effectively offering a bribe. For example if they want you to take your RV to the station where it is impossible to navigate it. I am not advising you to do it, but you can try offering to pay the fine on the spot. You won't get a receipt so you know the money is going into the cops pocket, but at least you are appearing to be above board. If you are driving down here for over a month, chances are you will get pulled over at some point, for some infraction, real or imagined. Simply budget a couple hundred dollars for it, and do not get upset about it. You will seldom see the federal police trying to shake you down, but it is still common with municipal or transit police. Another strategy that has worked for me, is to tell him you are lost and offer to pay for him guiding you out of town. Sort of a bribe, but legal. Make sure their shots are up to date and get them on a program to prevent heartworm. Carry flea soap & spray, as fleas & ticks can be a problem. Mexico does have good vets, finding one who can speak English can be a problem. Be prepared for a shock when you enter a vets office. They are often markedly more primitive than those at home. You cannot buy poop disposal bags in Mexico, take enough with you. You can, but ATM's are common in Mexico. The Canadian Scotiabank, & Hong Kong based HSBC, have tons of them. Scotiabank is associated with BOA. Maybe start with 1500 pesos before you cross. I have had one experience of a mistake with an ATM in Mexico, so it is a good idea to keep track of your account on line. Keep all ATM receipts just in case. Large supermarkets are common, including Wal Marts. You can buy anything (except decent whole grain bread, although I have found it in some). Cheddar cheese is hard to find. The larger grocery chains are Wal Mart, Mega, Gigante, Sobriana's & Ley's. The larger ones accept credit cards. if you are on a diet, the only diet soft drink is Coke & Sprite, but try Clight, the mango flavor tastes like real mango juice. Mexico uses metric, you may want to measure the height of your rig in metric. There are radar traps, so get familiar with the speed conversions. Very approx conversions are as follows. Garmin now includes Mexico with its North American Maps. If you wish to purchase a map book, look for Guia Roji (http://www.guiaroji.com.mx ). This is about $20 and covers all of Mexico, Guatemala & Belize. Many RV parks now have wireless access, in fact its more common than in the US. Many have satellite, so uplink speeds are slow & Skype may not work. You can purchase internet on a stick that works over the Mexican cell phone network for quite a reasonable cost. Telmex DSL connections are the most common high speed connections in Mexico. It is very good high speed & will support VOIP. Both XM & Sirius work well in Mexico. Sirius works better due to its higher satellite orbits. I have been told that Direct TV won't work south of Mazatlan, but Canadian based Star Choice works well all over Mexico. Go figure. There are no over the air English language TV stations in Mexico. However, Mexican soap operas are very entertaining even if you can't understand them. Digital TV is now the norm yet in Mexico. . This can get expensive. I suggest using Skype. If your cell is activated for Mexico, use it only for emergencies. It will cost a fortune. You can get relatively inexpensive pay & talk Mexican cell phones. Caller ID works in Mexico, so you can always let it ring then call back using a cheaper method. VOIP services such as Magic Jack or Vonnage Digital Phone will also work in RV Parks that have broadband wireless. Magic Jack plugs into a USB port and some digital phone services like Vonnage work if you plug the module into your Ethernet port then create a software bridge to your wireless. To do this the digital phone module has to be stand-alone (as opposed to built into a cable modem) with an Ethernet port & a phone port. Go into your network connections on your laptop, hold down the Control key, & click the Ethernet & the wireless connection icons. Right click & select "bridge connections" and you are done. Many North American cell phones will work in Mexico, but roaming charges can be high. Calling number display will work in many areas, so you can choose whether or not to answer. An alternative is to purchase a Mexican cell phone. There are "Pay & Talk" type cell phones available at quite a reasonable rate. The emergency number for Mexico, BTW is 088. I am not sure if this will work on US & Canadian cell phones, roaming. AT&T Go Phone, a US pay & talk phone, will work in Mexico roaming on TelCels network. It is 25 cents a minute. It also works in Canada. This is a good option as people calling you can dial a US number. Mike & Terri Church's Books Mike & Terri Church write the definitive guides on RV'ing in Mexico. They also have a Truck Camper. The newest edition of the guide came out in Fall 2009, so its outdated, but dDon't go to Mexico without a copy. Just keep in mind not all parks in there still exist . Dot &Bill's Mexico Site This is one of the best, if not the best, web site for Rv'ing in Mexico with Maps containing clickable links to RV Parks. It is the work of Dot & Bill Bell of North Vancouver, BC.